The colors are nice and bright! I would buy these again. Easy to put together took about an hour. Have it all with this contemporary style Brisbane wooden patio conversation set by International Caravan Home Furnishings. This group features a unique low profile 2-tier acacia coffee table, a sofa and patio chairs for enjoying a nice summer day. So sit back and enjoy the sunshine and ice cold lemonade, and converse with friends and family with the elegant Brisbane patio conversation set. 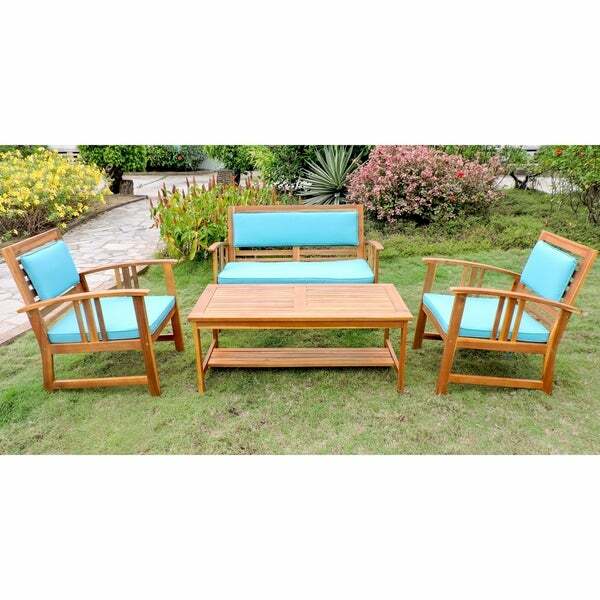 The set includes seating for four for relaxing on the deck, porch or sun room. Weather-resistant cushions with UV protection and comfortable foam padding are also included. Dimensions 20.0 In. X 43.0 In. X 18.0 In.